Mercedes-Benz GLC Coupé Performance, Engine, Ride, Handling | What Car? Like the regular GLC, the GLC Coupé doesn't benefit from Mercedes' latest four-cylinder diesel engine, which debuted in its E-Class saloon. Still, with 201bhp to call upon and a healthy slug of low-rev pulling power, the GLC Coupé doesn't struggle for pace when asked. Across particularly hilly terrain the 250 d feels slightly breathless at times next to the beefier six-cylinder 350 d diesel. Nevertheless, in both cases, the standard nine-speed automatic gearbox does a good job of selecting the right gear most of the time, which gets the best from the lesser engine. 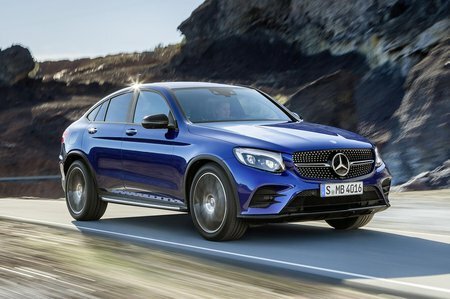 The GLC Coupé's 2.1-litre diesel engine grumbles when pushed hard and there are minor vibrations at the controls, but it settles down nicely in relaxed driving and is no worse than the engine in a BMW X4 xDrive20d. Aside from a little road noise, the GLC Coupé's interior is quiet at speed, too. Mercedes’ famously smooth and creamy six-cylinder 350 d is a much more refined prospect, firing to a smooth idle and never causing vibration or too much noise when pushed hard. However, it’s higher price and running costs need to be considered first. We’re yet to try the entry-level 220 d.
If you’re after a petrol powerplant, there’s currently only one option: the AMG-fettled GLC 43. This packs a twin-turbocharged 3.0-litre V6 that provides rapid acceleration. It might sound great and be fast, but you’ll be lucky to see fuel economy in the high 20s, especially if you enjoy yourself. The GLC Coupé gets the same variable steering set-up as the GLC, but it's been made slightly quicker to give a sportier feel. In truth, while it's fairly precise, it still feels unevenly weighted and uncommunicative. There's no doubt a Porsche Macan has more feelsome steering and is more agile, too. There are two suspension options: a standard non-adjustable set-up and optional air suspension system. In the latter’s form the GLC Coupé soaked up the rough roads well on standard AMG Line 19in alloys and gave a pleasing floaty cushioned ride on the motorway. Selecting Sport mode stiffens the suspension and adds steering weight and gearbox sharpness, but this doesn't stop the GLC from leaning heavily in corners. Ultimately, on a tight and twisting British B-road, you’d have more fun in an X4 or Macan. Even the GLC 43 isn’t that enjoyable to drive quickly and doesn’t ride as well as its lesser siblings, either.